5 Tips to Finding Joy in Your Life, and How to Start Today! Today, we are celebrating the Day of Joy in conjunction with the publication The Joy Plan by Kaia Roman! Read on for ways that Kaia has learned to bring joy into her life today and every day. A few years ago, my business crashed and my self-esteem hit an all-time low. Although there are far worse fates than the failure of a business, it felt like the last straw in a long string of failures in my life that all pointed to my inability to do anything right. As I sunk into depression, my friend Niko suggested that if I focused on making joy my top priority for one month, my entire life would turn around. With no job, no plan, and no other ideas, I decided to give it a try. For 30 days, I went after joy from all angles—from the scientific to the spiritual, and everything in between. I tried every tool and trick that was recommended in every self-help book I could get my hands on. It was remarkable to see what worked and what didn’t. And yes, Niko was right. 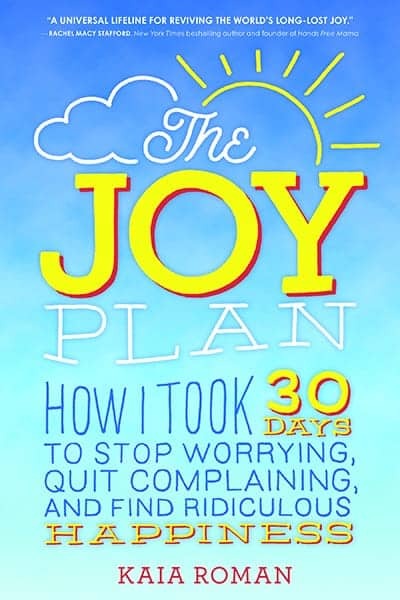 After 30 days, I had experienced enough changes in my life that I was able to not only continue my Joy Plan, but to write a book about the extraordinary events that took place in the six months that followed (The Joy Plan, Sourcebooks). The Joy Plan has become a way of life for me now, and the discoveries I made during my experiment are now my everyday practices. The good news is, you don’t need to take 30 days or make major changes in your life to do these things—they are simple enough that you can start today! Today, I teach a research-based Mindfulness curriculum to elementary school children. Because I’m a total science geek, to me, mindfulness is all about physiology. It’s about doing whatever it takes to bring your attention to the present moment, into your body, and out of your chattering mind. And it’s been shown to have multiple health and brain benefits. I start each day with 10-15 minutes of gratitude, either by writing in my gratitude notebook or simply reciting in my mind what I’m grateful for. This helps me get into the right headspace for whatever the day will bring. It is impossible for our brains to be in a state of appreciation and fear simultaneously, so I do my best to appreciate like crazy as often as possible. Being kind to others feels good. In fact, it releases dopamine in the brain. It helps take our attention off of our own troubles, and also creates a feeling of interconnectedness. I try to do something kind every day, whether that’s as small as smiling at everyone I see or a big as making a donation to my favorite charity. It took me some time to break the ingrained habit I had of frequently complaining, but making this shift has had a huge effect on my mental state. Instead of complaining now, whenever there’s something I’m unhappy about, I use my urge to complain as a springboard to create something new—to focus on a solution rather than a problem. Unfortunately, joy doesn’t come easily for everyone. But with practice and repetition, joy is a habit that anyone can cultivate. As we shift our mental habits, we change our experience of life. Kaia is the author of the new book, The Joy Plan (Sourcebooks, July 2017). She teaches Mindfulness to elementary school students in Santa Cruz, California and is a blogger for minbodygreen and other sites. She writes about how she went from joyless and anxious to grateful and optimistic so she can remember how she did it if she forgets. She’s also a communications consultant to some of Silicon Valley’s largest companies. For everyday joy and mindfulness tips, sign up for Kaia’s newsletter at TheJoyPlan.com. You’ll find her on Facebook, Twitter, and Instagram. In this time of political and social unrest, it’s easy to lose our joy. Lately, I have been unobtrusively observing other people and find there is a shortage of individuals who express real joy. Are the conditions of the world robbing us of our joy? I’m not saying that these things are unimportant or don’t need to be addressed and dealt with in a more effective manner, but in order to maintain our mental and physical health, perhaps we need to reassess our attitude as well as how we spend our time.